A caffeine headache can occur because caffeine is a drug that is common in our diet. This drug is highly advertised and socially acceptable in our culture so many people are exposed to it – often to excess. It is no wonder that caffeine headaches are so common. People refer to their first cup of coffee as a much needed “fix,” alluding to a possible caffeine addiction and their dependence on its stimulating effect. 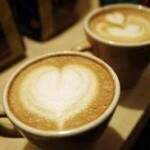 Caffeine can cause a host of physical and mental complaints, chief of which is a reaction called the caffeine headache. If you have headaches that have not responded to drugs or chiropractic adjustments, you should consider if your problem is that you are suffering from a caffeine headache pattern because of the use or overuse of caffeine in your daily life. Like other drugs, caffeine affects different people in different ways often depending on how often and how much it is used on a regular basis. In other words, if you take very little caffeine it will affect you one way (stimulation to the nerve system), and if you consume a lot of caffeine it will affect you in the opposite way (sedation and relief of a rebound headache). For this reason caffeine can cure a headache if it is used by someone who uses caffeine in moderation, and it can cause a headache if taken to excess – the caffeine withdrawal headache. 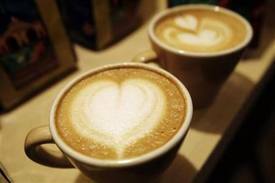 Caffeine is a double-edged sword if you have a headache; it can cause a headache and it can cure a headache. This is what makes it so difficult to treat a caffeine headache problem. Caffeine is a naturally occurring chemical in coffee, tea and cocoa beans. In the human body if functions as a flavorless drug that is a stimulant to the central nervous system, and acts as a diuretic. Caffeine is frequently added to appetite suppressants, cold medicines and pain relievers because, for reasons not understood, it makes them work better. For this reason doctors suggest to patients to take various medications with caffeine to increase the effectiveness of a variety of drugs at a lower dose. By understanding how caffeine affects the body and using it in moderation it is possible to avoid the caffeine headache, as well as how to use it to treat other types of headaches like tension headaches and migraines. 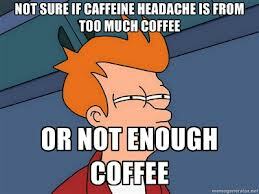 Caffeine is commonly added to many prescription and over-the-counter headache drugs (Anacin, Excedrin, Midol, etc.). These analgesic medications work 40% faster and more efficiently because caffeine increases their absorption through the gut lining and blocks the pain (adenosin) receptors in the brain. This greater effectiveness reduces the amount of drugs needed to control or eliminate headache pain, thus reducing the risk of drug side effects and addictive usage. Caffeine works best as way to treat headaches when a person does not consume too much caffeine regardless of their sensitivity to it. Sensitivity to caffeine varies from one person to the next, as is the amount that can be consumed daily without adverse effects. Initial consumption of caffeine often will have a positive response such as increased mental alertness, decreased sleepiness and fatigue, as well as improved muscle coordination. However, prolonged or high consumption, or for those who are sensitive to caffeine, can lead to many undesirable effects. Heart contractions that pound in the chest even while at rest. The headache from overuse of caffeine is known as a rebound headache. 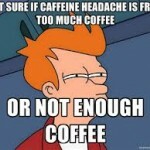 Caffeine causes rebound headaches when a person consumes too much caffeine based on their individual sensitivity to it. A caffeine headache usually starts as a deep dull pain behind the eyes (occasionally just one eye), then spreading upward until the entire head is in pain. 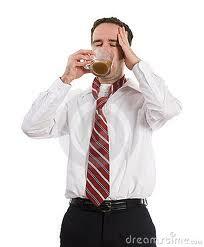 The intensity of a caffeine headache can range from a mild annoyance to severe and debilitating pain. Caffeine headaches are headaches caused by caffeine consumption in someone who has not had much previous caffeine intake, while caffeine withdrawal headaches are those caused by a temporary or brief stoppage of the intake of caffeine by those who are heavy caffeine users. Although too much caffeine can cause headaches by interfering with the delicate balance of adenosine and epinephrine in the brain, the most usual reason for caffeine headaches is interruption of the usual intake of caffeine from whatever sources are typically used in a day. Caffeine withdrawal can happen easily enough to someone who has a relatively low tolerance for caffeine and innocently reduces their customary sources of the drug. Very often the person does not think they are addicted to caffeine or anything else, yet it happens anyway to many people who simply enjoy their morning coffee (or two or three) and their lunchtime Coke, a bar of chocolate in the mid-afternoon, and a cup or two of tea at dinner. Slowly a person can gradually take in more and more caffeine over time, because of a developing addiction that is not obvious at first. Wonderful people are Coke and Pepsi addicts – children, too. It is estimated that caffeine withdrawal symptoms, such as headaches, occur in those people who take in about 500 mg of caffeine or more per day for two weeks or longer. This is not difficult to do; all it take s is just a few cups of coffee and maybe a few pieces of chocolate a day. Lots of us do that. All that is needed for caffeine withdrawal symptoms to occur is an interruption of the customary flow of caffeine into the body. When the body is accustomed to a particular intake of caffeine several changes take place in the brain that cause a dependence to develop. When the stimulation of the caffeine does not occur on schedule a person can experience unpleasant side effects. Most often we tend to laugh it off as “not feeling ‘right’ until I have my morning cup of coffee,” but the situation can be a lot more serious than just wanting to have some coffee. It can be understood as needing the coffee because of a caffeine addiction. Many of us have an addiction to caffeine, but do not know it because they are constantly pushing away caffeine withdrawal symptoms by using one more bottle of cola or another piece or chocolate or cup of coffee to make themselves comfortable. As the need arises by the subtle feeling of being tense, depressed, irritable, and tired or a headache starting behind the eyes, they put more caffeine into their body. Irritability or restlessness, from mild to severe. Headache, often starting behind the eyes before spreading up and around, from mild to severe. Fatigue, sleepiness or general lethargy. Difficulty concentrating or thinking; inability to easily perform simple mental tasks. Digestive issues (usually constipation, but sometimes also nausea and / or vomiting). Muscle pain/stiffness and a feeling of the body being overly heavy. Stuffy nose, like having sinus issues or other flu-like symptoms. The more complaints you recognize from this list the more likely you have a caffeine addiction. Actually, it is good news if you recognize yourself in this list of symptoms because the treatment is simple and direct. Correcting your dependence can completely eliminate what you now know are caffeine headaches. Suddenly stopping all caffeine intake can lead to rebound headaches, marked irritability and nervousness, nausea and a general worsening of unpleasant feelings and symptoms when you miss your morning coffee. Even so, it is necessary that you conquer your caffeine addiction in order to eliminate the headaches and related complaints that now control your life because of caffeine. Caffeine withdrawal symptoms usually will start 12-14 hours after your last full caffeine intake, and become the worst they are going to get at the 24-48 hour mark. After that the symptoms are considerably reduced and manageable, although they can last for 7-10 days. Identify your weakness for cravings – know what makes you consume caffeine. Do you eat the chocolate bar because you are looking for something sweet, to break the monotony of a boring job, or just to raise low blood sugar? Each of these has a better solution than a chocolate bar, or cup of coffee. Use substitutes – find alternatives that do not contain caffeine. Replace coffee with drinks made with rooibos (red bush tea), peppermint tea, chicory or a houjicha tea. Chocolate can be substituted with some other candy sweet or fruit. Colas can be substituted with fruit juice. If your intake of caffeine has to do with low energy, get your blood sugar tested and substitute with complex carbohydrates to balance blood sugar levels. If all else fails, use decaf brands of coffee and tea to start your plan in the right direction. Drink more water – flush the toxins out of your liver as you detox from caffeine. Promote the good and forget what is bad for you – spend time and effort finding new foods, drinks and treats to take the place of high-caffeine products. Go out of your way to encourage new things in life that give you pleasure and satisfaction. Get off caffeine – slow steady and gradual reduction, one day at a time, gets the best results. “Going cold turkey” might work for some, but it is not recommended. Try cutting back on your source of caffeine by half each week. In just two weeks you would be taking in 75% less caffeine, and in a few weeks more you are down to so little it seems silly to hang onto such a small amount. No one wants to live with a caffeine headache every day or tolerate the limitation to good living that caffeine withdrawal symptoms produce every day before that first precious cup of coffee in the morning. Get ahead of your caffeine consumption and get ahead of your caffeine headache.